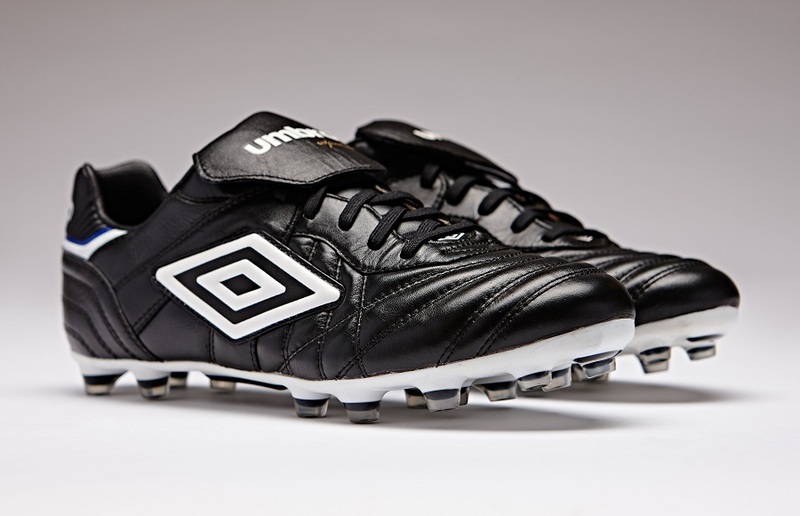 Home / Umbro / Umbro Speciali “Eternal” Released, And They Are Here to Stay! Umbro Speciali “Eternal” Released, And They Are Here to Stay! Reborn and ready to take on the modern game, Umbro has released the Speciali “Eternal” to take on everything the market has to offer! 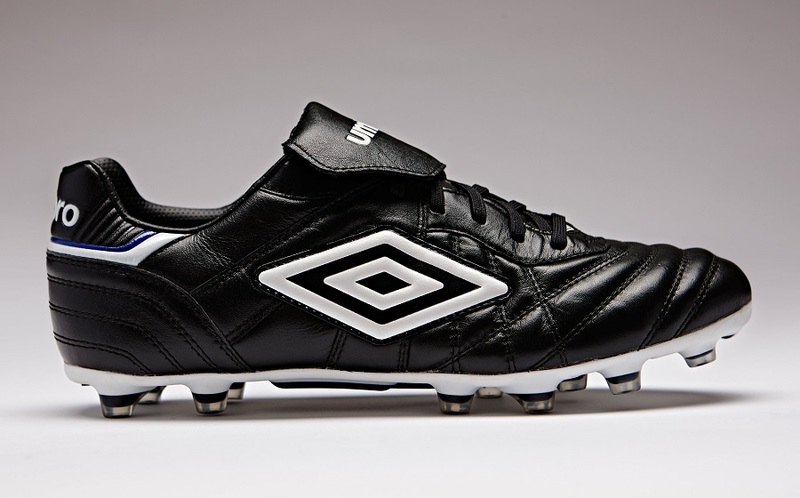 If these boots look similar, well they should because it is inspired by the greatest boot in Umbro’s history. Think of players such as Carlos Valderrama and his flair in USA ’94; Alan Shearer’s Golden Boot in Euro ’96; Roberto Carlos’ 35 yard ‘banana’ free-kick in 1997; Michael Owen’s incredible solo strike against Argentina in the 1998 World Cup. Over the years the Umbro Speciali has had different faces but its consistency has been a staple of its design and what players love about them. From July 1, the Black/White/Clematis Blue version of the Speciali ‘Eternal’ will become a permanent fixture in Umbro’s boot collection. And that makes us happy! Umbro has remained true to the classic visual appearance of these boots, but they have also factored in modern technology and what it takes for a boot to be successful in the current market. The Speciali Eternal isn’t simply a reproduction of the original, but has been re-engineered to meet the more demanding performance needs of the modern game. We are talking about a boot that has been designed and is fully equipped to compete against the likes of the Adidas Gloro and Nike Premier. How do we know? It all starts with the lightweight soft leather upper, offering the supreme comfort and durability which the original became famous for. Umbro has ensured that it is a key feature of the Eternal. Right across the forefoot you get a classic stitching and a clean ridged appearance that graced the front of all top old-school boots. 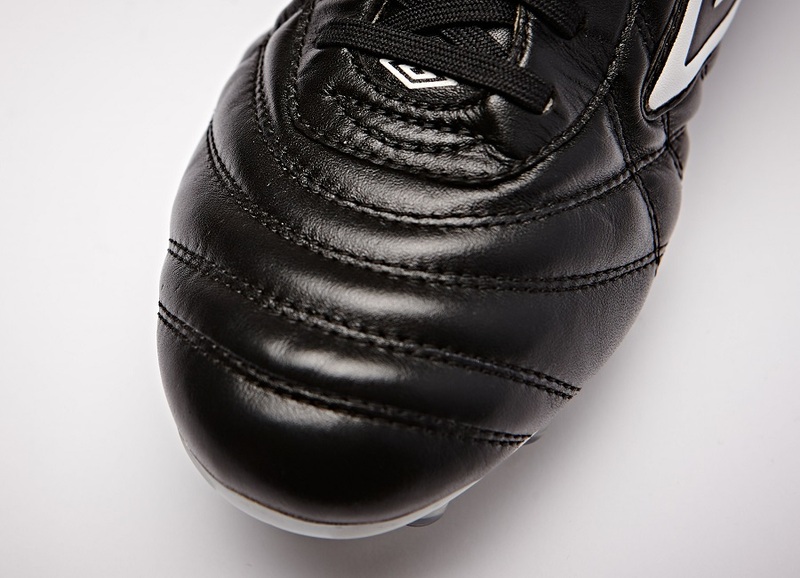 When the Speciali was first released in 1992, it was the lightest football boot on the market. In a world obsessed with graphic print and weight, Umbro has stayed true to the original and made comfort king. On the boot, Umbro’s A-Frame overlay offers exceptional support and stability, while the iconic fold-over tongue also returns but with a touch fastening to keep it in place. A dipped Achilles heel tab reduces foot fatigue and pressure, and the pre-moulded sock liner gives enhanced fit and support. One of the most memorable features of the original was the ‘Wishbone’ outsole. The new ‘Wishbone’ technology allows for controlled support throughout the full length of the soleplate providing increased rigidity in the mid-foot and controlled flexion in the forefoot. And rounding out the design, Umbro has added a matte finish on the outsole to complete the classy, timeless look of the Eternal. 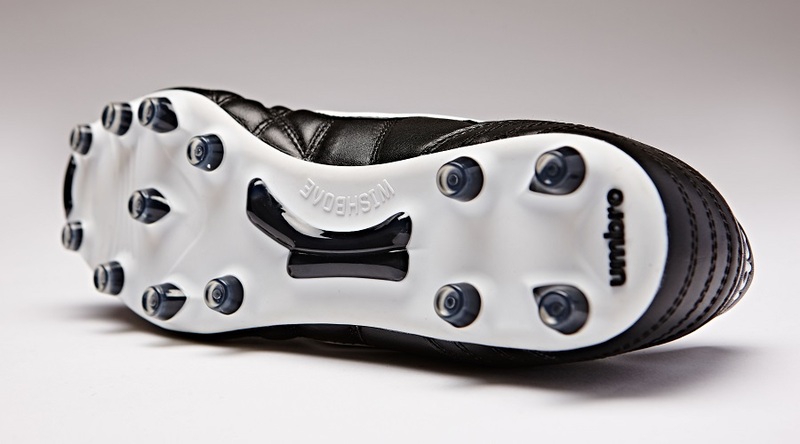 Added to that is one of the best stud configuration for comfort and reliability you can find on any boot. Conical, low profile and ideal for use on both FG and AG surfaces. With the release of the boot came the words “available globally”. We are still awaiting confirmation if that means they are bound for US shores and if so where. We certainly hope they make some sort of appearance here as they are easily a boot that will immediately become a contender for traditionalists in need of something new. 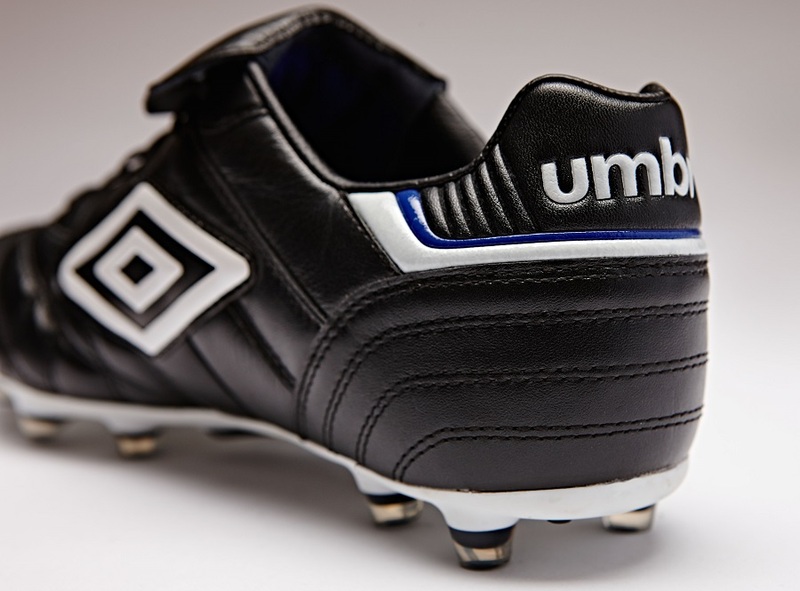 Great credit to Umbro for releasing an updated version of one of the most iconic shoes ever made. They seemed to keep the soul intact with the updgrades. I recently saw the white colorway, and it's one of the classiest looking boots on the market. Can't wait for the review! I know it's early, but any idea on the weight? Is it kangaroo or calf leather? I always wore the classic speciali. I always had to oder half a size bigger. how do this ones fit? True to size. I'm wearing a 9US and they fit real nice. What about the studs and the surface intended for playing with these boots? From the information provided by Umbro in their website I understand they are intended for the hard ground (in the internet i also see versions for the SG and the FG). No version for AG. I am wondering if the boots intended for HG would be comfortable for AG. E.g. I thought Nike Premier intended for FG would be OK for AG, but actually they are not comfortable for AG (for FG – OK). 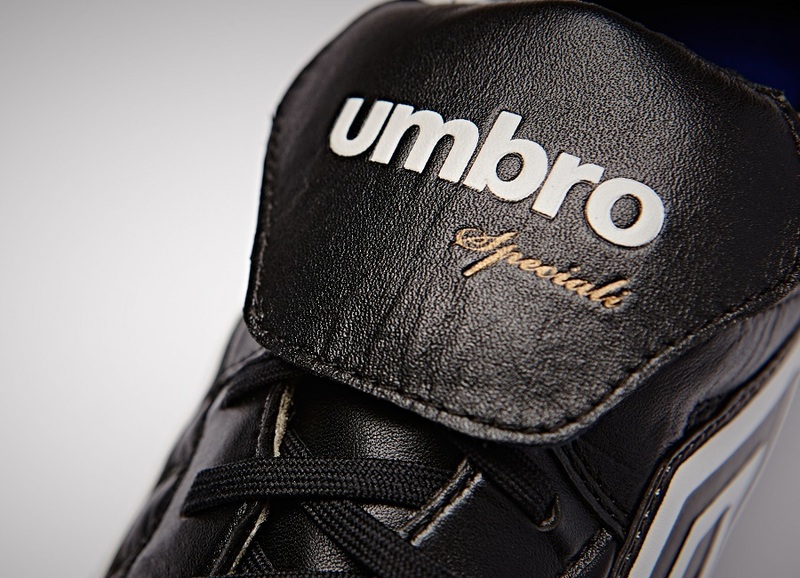 Anybody has any view / experience on Umbro Speciali intended for HG to be used on AG? Thanks. Having them in hand (I haven't worn them yet) I can tell you they are suited for both FG and AG in the right conditions. FG when it is dry and the grass is decent quality. AG when the surface is a newer material, set to mimic real grass! In these circumstances, they will easily transition well between both!